Let’s get ready to rumble… and try something new! One thing I should mention is that I have been DMing for a good many years… but for the first five I was rather weak. I have learned a lot in recent years, benefitting from seeing many far better DMs practice the craft. In general, I try to keep what I share in my blog relevant to any DM so they can share in my learning. I periodically experiment with really strange encounter concepts and learn from the results. Friends in a home campaign are usually lenient enough to forgive you if it doesn’t quite work out. I now have enough experience to recognize when an experiment fails and to turn it around or at least mitigate the damage. More than ever before, DMs have access to all kinds of ideas. There are some really smart people out there. 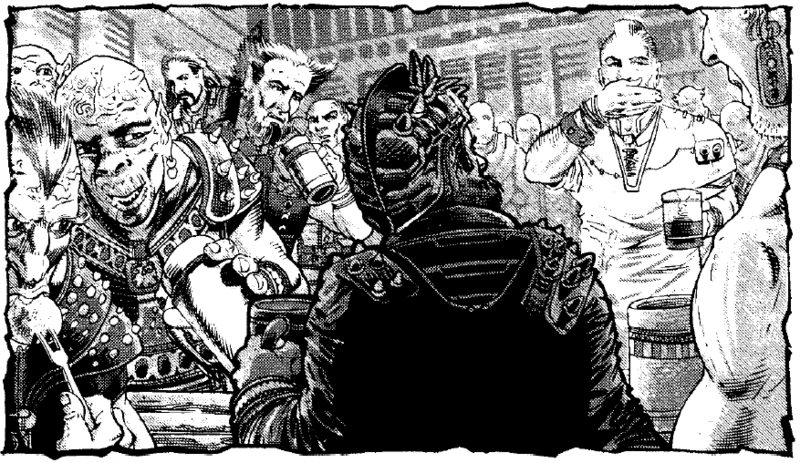 One of them is The Jester, who put together some really interesting posts on the subject of alcohol in 4E. He both came up with rules for inebriation and for drinking contests. He took it further and added everything you needed for a bar fight. You can go check these out now or later, but I do highly recommend reading them at some point. Alcohol Rules for Dungeons & Dragons 4E (by Jester at At-Will) Alcohol Rules File. Dungeons & Flagons Essentials: Barroom Blitz (by Jester at At-Will) Bar Room Brawl Rules, Bar Room Brawl Powers. These cool articles have just about everything you need for alcohol, competitions, and a huge tavern brawl. From damage for a skillet to the at-will attack power with a bottle (and what happens when you break the bottle), to the cooking staff that comes after you. The rules are setting independent. I took the alcohol names and I replaced them with Dark Sun alcohol (you can find Athasian food and drink here, in turn coming from various sources I list on that page). I modified the skill challenge to fit my needs. I added some plot to tie in the previous events. In our game, they were looking for information on a templar’s secret hideout. They chased down one of his half-giant guards to find the info. The PCs encounter the half-giant, clearly in sorrow and muttering to himself outside the tavern. The half-giant takes the AD&D concept to the extreme and is incredibly mercurial. As the PCs talk to him he shifts personalities to that of the speaker. One moment he is sad, then confident, then angry, etc. When the PCs ask about the templar, the half-giant becomes full of evil and hatred. But, overall, the half-giant is sad because all of his friends are gone (the PCs know they killed them, for a bit of dark humor). The PCs finally agree to be his friends and go into the tavern with him… and then they walk in to realize the half-giant has signed up for a drinking competition, and they are his teammates. Good times! I ran the encounter first as a five-round competition. I would first run the skill challenge Jester suggested, with a number of modifications and some additional angles based on the PCs. We had a lot of fun RPing (and making fun of the warlord’s terrible rolls). At the end of each round the drink would make an attack on all PCs. The attack was based on the alcohol, which changed each round. I described the Athasian beverage and its effects. Finally, at the end of the fifth round the PCs were still standing and had done better than the other three teams. And that’s when the other teams were furious to have been cheated by the PCs and the brawl began. PCs were not allowed any normal class powers, though I allowed a few that made sense (such as psionic telekinesis) and racial powers. This forced them to use the room powers, such as bottles and chairs. I also allowed for anything creative the PCs came up with. The battle was harder than I expected it to be… especially since I used the map from the Hammerfast supplement, placing sand at the bottom of the pit and a modified Pit Viper snake. One of the teams had a leader that could slide with a hit… into the pit went our Thri-kreen. (Of course, he teleported himself and the snake up top and the snake caused a lot of pain for the bad guys). Having the opportunity to do something different and use new powers was cool. I think the concept was a lot of fun. We all had a good time. The rules are very creative and well balanced. We all had trouble tracking the dual nature of the disease track for getting drunker and then the effect of the drinks. It was cool to have different alcoholic beverages do different things, which left PCs with different drunk induced effects during the combat. But, it was hard to communicate those clearly. I would suggest printing for each PC a handout of the disease progression. Let them fully understand this and track their progress. I am sure we forgot to use some effects because players didn’t have the information in front of them. Similarly, when I next use this (and I will) I will print out drink effect cards to hand to those I hit with the alcohol attack. They can exchange their card for a new one if I hit with a new beverage. This way, when combat starts they know exactly what effects they have. I would also tweak the effects. You don’t want to be slowed all combat, but becoming slowed when something specific happens could be cool (or even a save at the beginning of each turn to see if you are slowed this round). The sliding and on-crit ideas were excellent. Finally, I wanted players to think of things to do and then give them the power cards at that time. This seemed to work ok at first, but it ended up encouraging others to do the same. Once one PC realizes that they can smash a chair on a guy, every other PC thinks to do that instead of thinking of other things that might work. I had foes use other tricks, but this delayed knowledge then became a disadvantage for the players. When I next do this I will provide them all of the powers and use the terrain to make some easier to reach. I give Jester’s rules a really high rating. Where they didn’t work in my game it was due to my own lack of foresight about how they would work for our group and how to make sure the information was transparent. This could have been really incredible, but was “just” a lot of fun. But, that’s part of taking risks. When you try something new it can fall short of what it could be. Each time you take a risk you learn a little about how to do it better next time. The simple act of trying something new keeps the game interesting. This was a fun session and next time I do this it will be even better. When I get a chance I will write about the last session, where I used more than 70 minions. Sounds like a train-wreck, and I was worried it would be. It was sweeter than kank honey. More to follow. This entry was posted on October 9, 2015 by Alphastream and tagged 4E, Crown of Sorrow, Food, Props, Tavern.